Backyard-made pizza in a minute flat—literally. 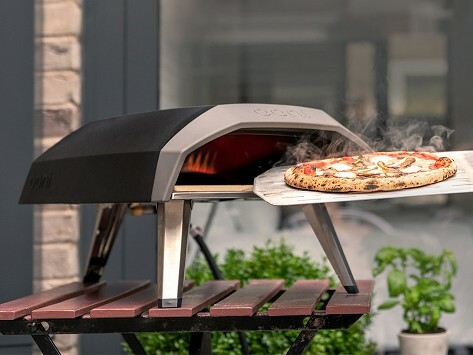 The Ooni Koda outdoor gas pizza oven has a built-in ignition that heats it to a pizza-perfect 900 degrees in less than 15 minutes. A heat-control dial helps you stay on top of the temp when cooking a crispy pizza in 60 seconds and charred veggies and meats in under five minutes. Heading to an outdoor party? Take this compact—and chimney-less—portable oven with you. Connect to a gas source and it’s ready to fire up. Dimensions: 24.4" x 15.7" x 12.2"
Great fun to use and pizzas are delicious!